Friday, Aug 20th left Tecate at 730 AM, approx 1 mile south of Tecate starts the road construction and for approx 20 miles south. It took me 2 hours to cover the 20 miles with my 38 ft Motorhome pulling the JEEP. FYI - My advice is for anyone with large motor-homes or trailers not to cross the border at Tecate and head south for some time, as they are actually moving mountains to open up this new highway. Apparently, when this section is finished, they will continue on to Guadalupe Valley where the newer construction was completed earlier this year. Several miles south of Ensenada for approx 3 miles there is more construction and of course the bypasses are very rough..
South of El Rosario starting at the washed out bridge for another 5 miles there is more construction. 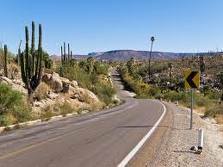 Apparently there is a big drive on by the Mexican Government to complete most of the road construction over the next two years in Baja..